Around the world, nearly 150 million children under the age of five suffer from stunting. This is a chronic condition that can occur if a child does not have access to the right nutrition – in particular during the crucial first 1,000 days of their life. Stunting not only affects a child’s health, making them more susceptible to disease and infection, but also impairs their mental and physical development – meaning children who suffer from stunting are less likely to achieve their full height and cognitive potentials as adults. Children who suffer from stunting or wasting are more likely to suffer poor health and be at risk from disease and diet related conditions. Mothers affected by undernutrition are more likely to have children who suffer from stunting or wasting, perpetuating the cycle of poverty and undernutrition (Ozaltin, Hill, and Subramanian 2010). Well-nourished children are 33 percent more likely to escape poverty as adults (Horton and Steckel 2013). Miranto is 5 years old. He proudly wears his school uniform, a blue smock, along with Mickey Mouse sneakers and a tilted baseball cap. He’s been in school for two years, where he’s on track and has made dozens of friends. Sitraka is a head shorter than Miranto and looks about half his age. He’s not wearing any shoes, and his tiny T-shirt reads “Special Baby Boy.” He’s still learning to speak and has trouble sitting or standing still for any length of time, which means he can’t go to school and has trouble making new friends. 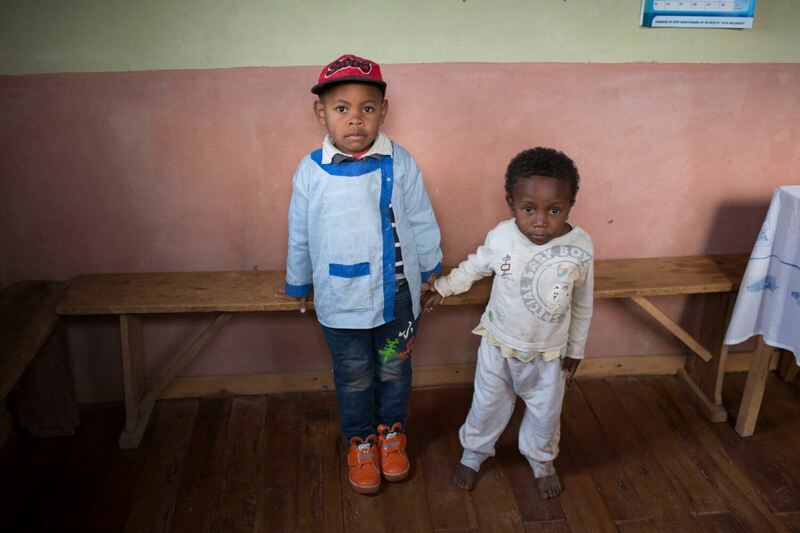 Miranto and Sitraka were born in the village of Ambohimidasy Itaosy, about an hour by car outside Madagascar’s capital city of Antananarivo. They were born on the very same day and are both 5 years old. While Miranto has been in school for two years, Sitraka is still learning to speak and struggles to sit still. He suffers from stunting, like 47 per cent of children in the country. 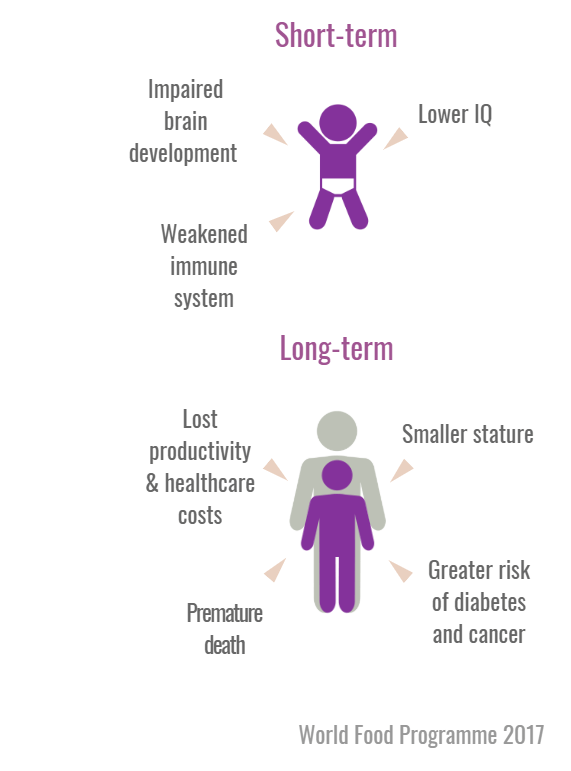 The images below illustrates the effects of stunting on a child’s brain. Specifically, diffusion-weighted imaging was used to examine a variety of white matter fibres in a single stunted infant (top frame) and a single non-stunted infant (bottom frame), at 2-3 months of age. As is apparent, the density and richness of this network of fibres is far more elaborate in the non-stunted infant than in the stunted infant. It is important to keep in mind that this is but a single (albeit representative) infant; thus, until these findings are replicated at the group level, such findings should be considered preliminary. These data were collected as part of an ambitious program of research taking place in Dhaka, Bangladesh (Charles A. Nelson, Ph.D., Principle Investigator), supported by the Bill and Melinda Gates Foundation. The goal of this work is to examine the effects of biological and psychosocial adversity on early brain development. Nadine Gaab, Ph.D. and her colleagues are overseeing the MRI portion of this project, including the tractography data illustrated in the image below. Stunting is a global problem. 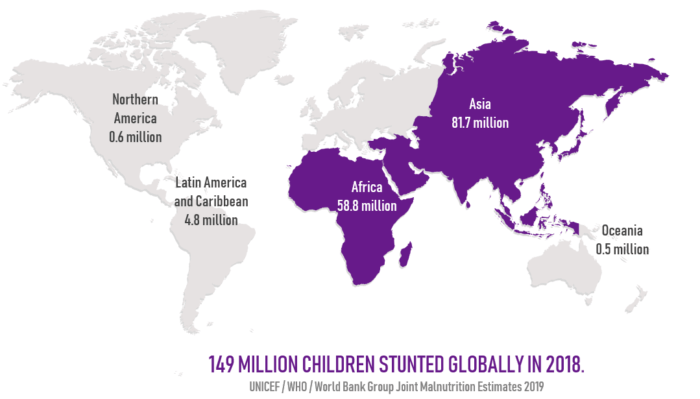 Although important progress has been made to reduce child stunting, stunting is declining too slowly and levels still remain unacceptably high. In April 2019, UN agencies reported that 149 million children under five – almost 22 percent of all children in the age range – were affected by the condition in 2018, depriving many them of the opportunity to achieve their full potential before they even reach school age. In 2018, more than half of all stunted children under 5 lived in Asia and more than one third lived in Africa. Critically, existing evidence supports the need to scale-up interventions aimed at guaranteeing access to nutritious foods and breaking the intergenerational cycle of undernutrition and stunting. 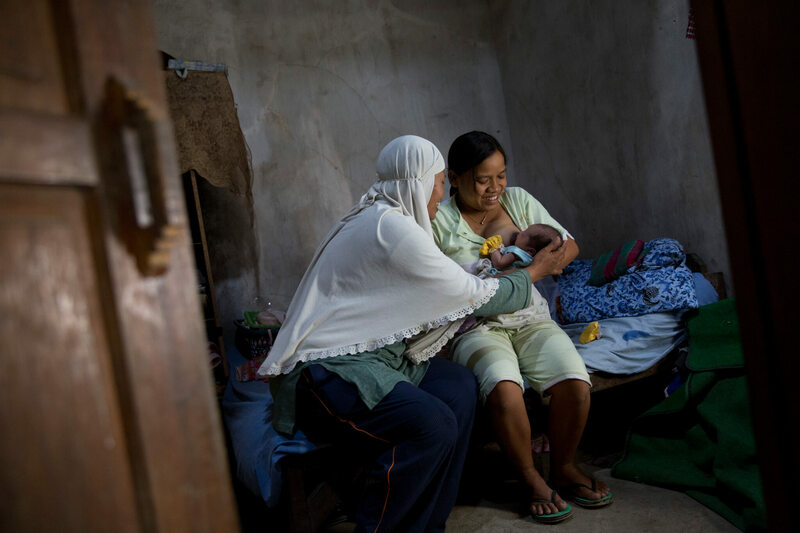 The first 1,000 days of life – between a child’s conception and their second birthday – has been proven to be the key opportunity to prevent child stunting promote child nutrition, growth and development, which will have a lasting effect over the child’s whole life.